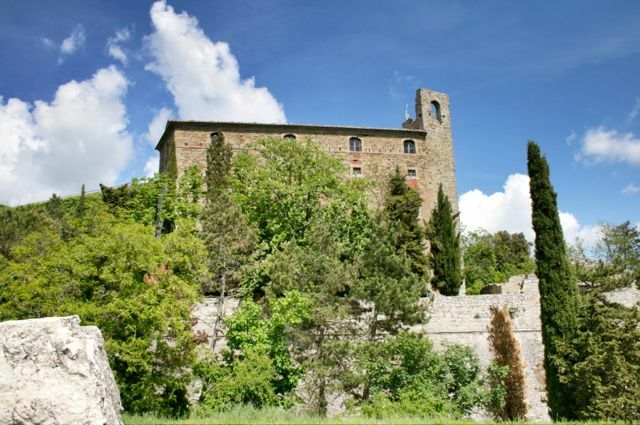 Cortona is a Tuscan hill town high above the broad Val di Chiana, since the 1990′s it has been put firmly on the tourist trail by the popularity of Francis Mayes’ book about living in the town; Under The Tuscan Sun. Despite the popularity of Cortona with visitors, it doesn’t take long to escape the crowds if you head up some of the steep medieval streets. 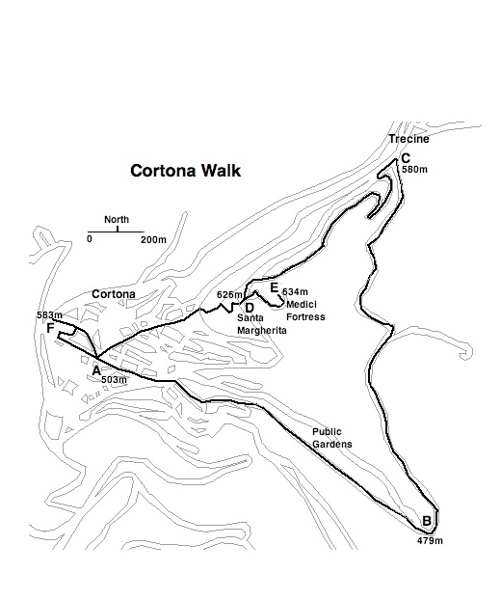 You can find instructions for this walk around Cortona is in my self published book, Circular Walks On The Tuscany Umbria Border (available for the Kindle or any electronic device that has a Kindle App). It was a beautiful day and perfect weather, so once we had stopped for a superb birthday meal at Trattoria Dardarno we decided to walk off the calories on my two hour walk. 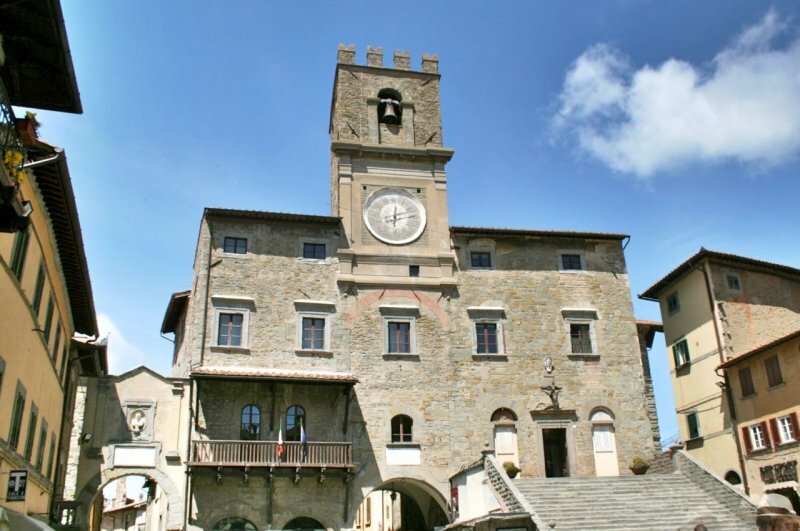 We started in the Piazza Repubblica, the piazza has Cortona’s medieval town hall which dates back to days when the town held its own as a city state. For a small town like Cortona this independent state of affairs was never going to last and it was eventually swallowed up by the Medici Dukes of Tuscany and ruled from Florence. The route of the walk took us along Cortona’s flattest street, via Nazionale, and out along the tree lined avenue used by many of Cortona’s residents for a stroll. Once at the tennis club at the end of the avenue the route starts a long and reasonably shallow climb towards the hamlet of Torreone, high above Cortona. Along the way, the views become more magnificent and about two thirds of the way up we passed Bramasole, Francis Mayes’ original house. Once at the hamlet of Torreone, we turned back towards Cortona walking along a cypress lined gravel path. Of course, there were more wonderful views along the way! Once back inside the town walls we were in a broad piazza in front of the church of Santa Margherita, the town’s patron saint. Built in the 1800′s, the church has a Romanesque facade that dominates the piazza. 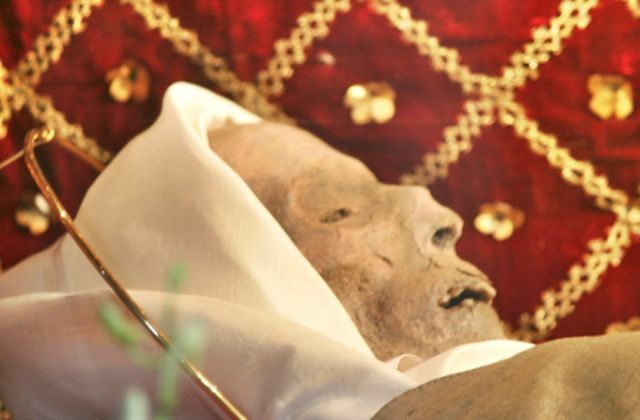 Inside you will find the body of Santa Margherita in a class coffin. and a high ceiling supported by striped marble columns, inspired by the different coloured stripes used in many of the great medieval cathedrals of central Italy (Siena and Orvieto spring to mind). The ceiling is decorated with stars on a blue background, you will find find this type of decoration on the ceiling of the upper Basilica in Assisi and many other medieval churches. A quick stroll up to the Medici fortress took us to the highest point on the walk and more views to Lake Trasimeno, the Val di Chiana and beyond. The Medici Fortress is sited on the same spot as the Etruscan acropolis, clearly its elevated position is the perfect spot to defend. Soon, we were descending through Cortona’s steep medieval streets, there were photo opportunities at every corner. 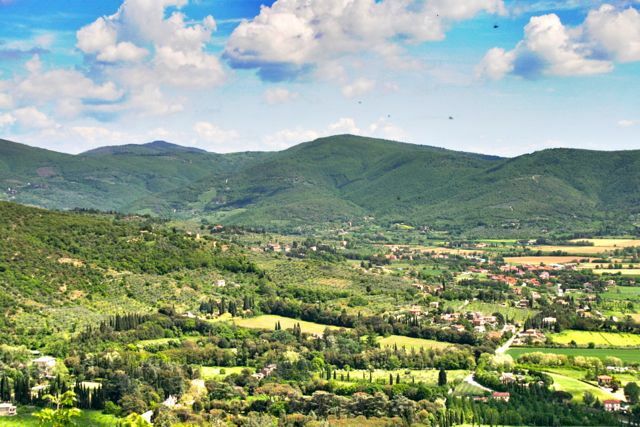 Via Berretini, named after Pietro Berretini, who was also known as Pietro da Cortona, the architect, heads straight down the hillside towards the centre of Cortona. At the bottom of via Berretini is the church of San Francesco, this was the first Franciscan church to be built outside of Assisi. Most Franciscan churches in Italy are quite large and barn shaped to accommodate the huge congregations that the movement attracted. Soon, we were back in the Piazza della Repubblica and ready to head for home.